How can I open a cmd window in a specific location without having to navigate all the way to the directory I want? EDIT : This software will not function on a version of Windows earlier or later than Windows XP. C:\Windows\System32\cmd.exe /K "cd /d H:\Python\"
If you have Windows Vista or later, right-click on the folder icon in Explorer while holding the Shift key, and then click on the "Open command window here" or "Open PowerShell window here" context menu option. 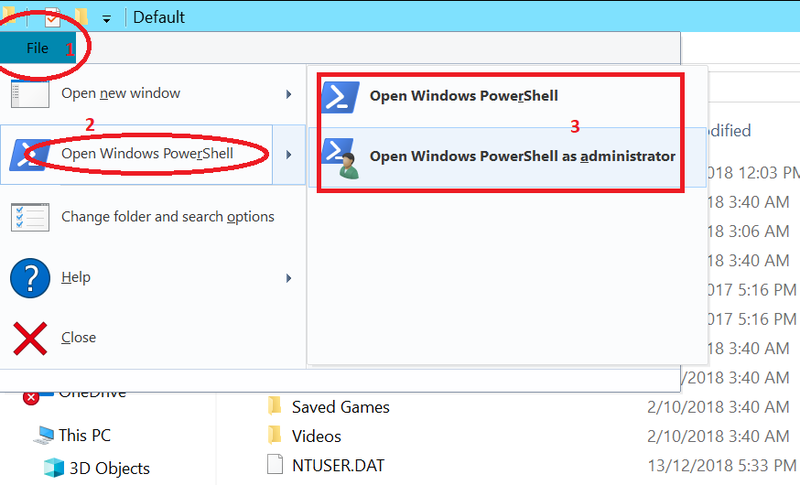 [only Win8+] Click the Explorer Ribbon's File button, then click on "Open command window here" or "Open PowerShell window here". [only Vista or Win7] Hold down Shift when opening the Explorer File menu, then click on "Open command window here". If you can't see the menu bar, open the File menu by pressing Alt-Shift-F - Alt-F to open the File menu, plus Shift. For Windows XP, use the PowerToy mentioned by dF to get the same function. Now when address bar is highlighted, type cmd in the bar. From Windows 7 up to some versions of Windows 10, it is very simple to open a command prompt anywhere you wish, without navigation using command "cd". Try the following one. Click the mouse's right button by holding Shift key . It will produce an option like this. 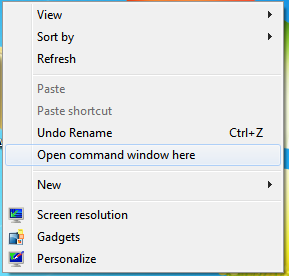 Then simply select the "Open command window here " option. The latest versions of Windows 10 have replaced this feature with "Open Powershell here". On Windows Vista, Windows 7 and Windows 10 simply hold down the Shift key and right-click on a folder. 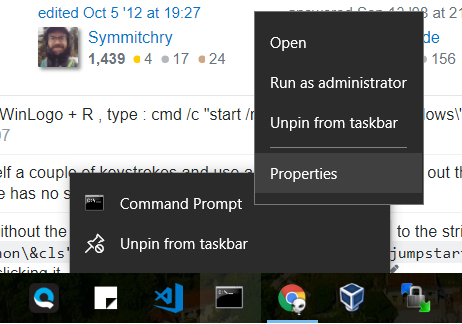 The context menu will contain an entry titled: "Open command window here"
Update 2: In windows 10, go to file menu and select "Open Windows PowerShell". There is an option for running as administrator. cmd /K "cd /d c:\WINDOWS\"
Just write cmd in the address bar, it will open in the current folder. Create a shortcut and edit the "Start In" property of the shortcut to the directory you want the cmd.exe to start in. Open any folder on windows explorer. In Windows 8, you can click the address bar and type "cmd" (without quotes) and hit enter. This will open the cmd window in the current path. I just saw this question and cannot help to post my AutoHotkey script for cmd on Windows XP. You can spot the hot keys in the script. The nice thing is when your current windows is Explorer, the cmd will open in the path showing in the address bar. I keep this script in a folder where I store all green tools (including AutoHotkey). For a new machine, I just copy the folder, double click the script to associate .ahk with AutoHotkey and create a shortcut in my startup folder. It is faster than installing PowerToys. Update: This is built into Windows now. See this answer. The XP powertoy is a good option, but I thought I'd post another, in case you'd like to "roll your own". Create a text file, name it anything.reg, paste in the code below, save it, then double-click on it to add it to the registry (or just add the info to the registry manually if you understand what's going on in this .reg file). For windows 7 or later, inside the target folder address bar just type cmd. That is it. It will open up command prompt with path set to your present directory. Easiest way is to goto the address bar of the Windows Explorer and type cmd there. It will automatically open the command prompt window for you. In File Explorer, press and hold the Shift key, then right click or press and hold on a folder or drive that you want to open the command prompt at that location for, and click/tap on Open Command Prompt Here option. For windows : Select the folder which you want to open in command prompt - After selection, Keeping the 'Shift key' pressed. Right click there and choose option "open command window here"
In Windows Explorer - shift + right mouse click above folder "Open command window here" option show up in the menu. Or in language of your Windows version. Make the shortcut to cmd.exe with params /S /K pushd "C:\YOUR FOLDER\"
In windows 10 go to folder location in file explorer remove path and type cmd and press enter. and path will open in cmd. You can also pin it to your taskbar and then use WindowsKey+[1-0] as a keyboard shortcut. Hit Start, type "cmd", Right-click "Command Prompt" > Click "Open File Location". Copy the "Command Prompt" shortcut to the directory where you wish you could just open cmd at directly. Right click your new shortcut and click "Properties". Edit the "Start in:" field to be either blank or %CD% and then click "OK". Now when you click this shortcut it will open the command prompt pointing at the current directory that the shortcut is currently in, e.g. copy this shortcut to the desktop and run it to open cmd to the desktop directory. ****Note: if you want the explorer to complete the task don´t put the CD command. In order for you to open a particular directory with the explorer.exe aplication while using cmd you can use the command START and the absolute route of the folder that you want to display. This method is using cmd.exe and Send to shortcut so cmd.exe can open directory directly. This alternative method is in case of not having Open command window here in right click menu. Open 'File Explorer' and enter shell:sendto in location bar to navigate to Send to folder. Copy a Command Prompt shortcut or create a new shortcut .lnk file. Edit the properties of the shortcut and edit the target to %windir%\system32\cmd.exe /k cd /d and press 'OK' to save the change. 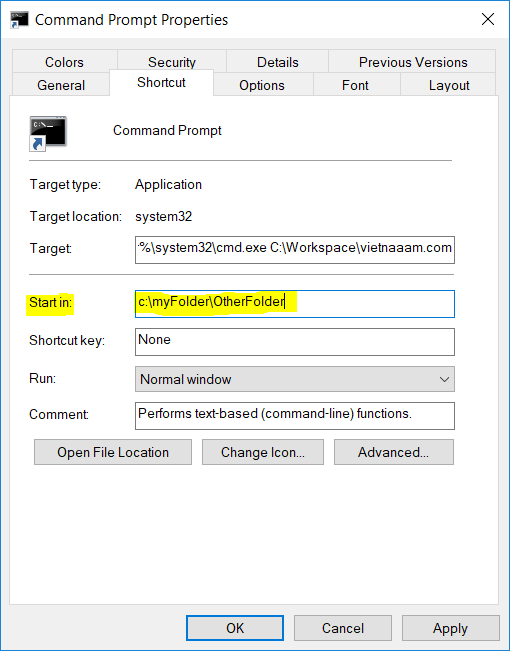 Right click on a folder and expand Send to menu to use the cmd shortcut. This shortcut should open a cmd window with directory selected by the right click. This method should work under Window 7 and 10 at least. Name the shortcut as Command Prompt (cd) to specify the task of the shortcut. Show 'The directory name is invalid.' if other than folder is selected. Show 'The system cannot find the drive specified.' if the folder is not existed. Show 'The filename, directory name, or volume label syntax is incorrect.' if multiple files are selected. Little about shortcut: The directory would be automatically added to the end of the shortcut as a parameter when using under Send to, so the shortcut does not need to type in the directory. Right click the desktop and navigate to new and then from the sub-menu select "shortcut" → Browse to the Windows directory (or folder) and then to the system32 directory and click OK.
Click Next and Finish. Right click the new CMD icon on your desktop and select properties, and Next to the Start. In options, delete the line and add the path to wherever the directory is that you want it to start in... For example, C:\temp\mp3 and click OK.
Rather than saving it as a shortcut, this is how I do it and I find it very useful. There are already answers to show as a shortcut, but I just wanted to share this, especially I find it very useful for angular projects. Create a new txt file and write the following code into it. save as .bat file with a convenient name. (I usually save it as "goto-myProjectName.bat"
Then type your bat file's name without its extension. Then it should take you to there. Not the answer you're looking for? Browse other questions tagged windows cmd or ask your own question. How do I load a file into the python console? Get path of from where python file is called?